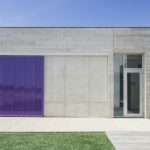 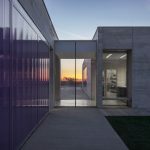 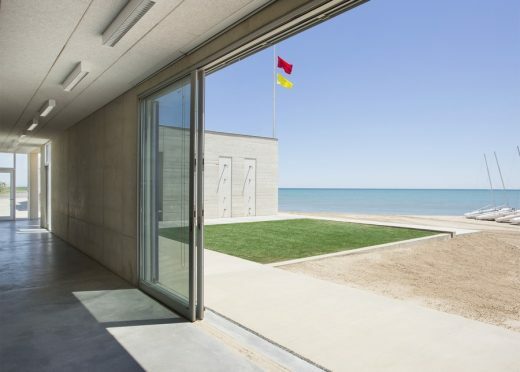 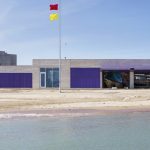 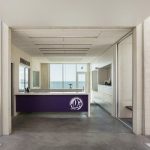 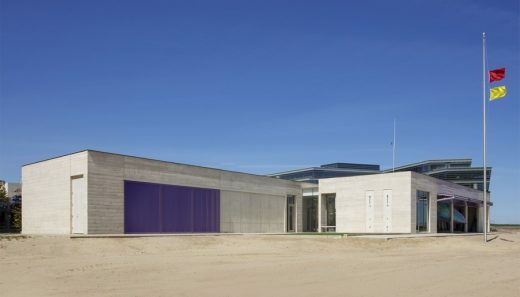 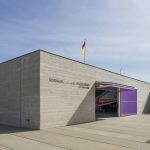 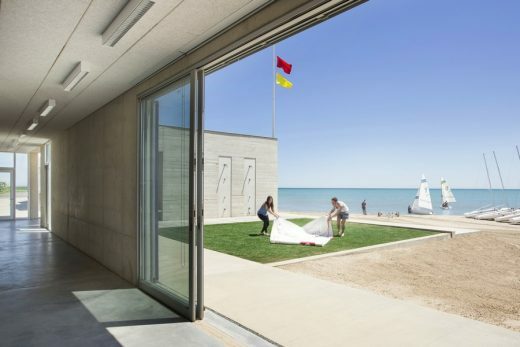 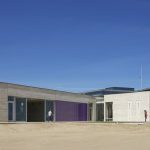 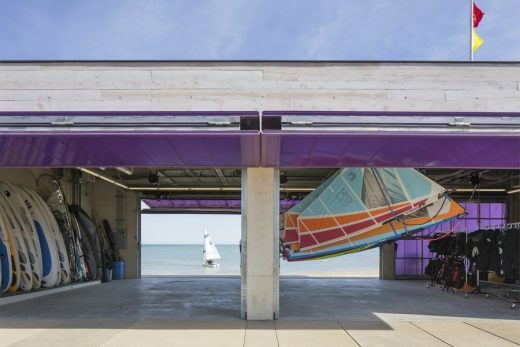 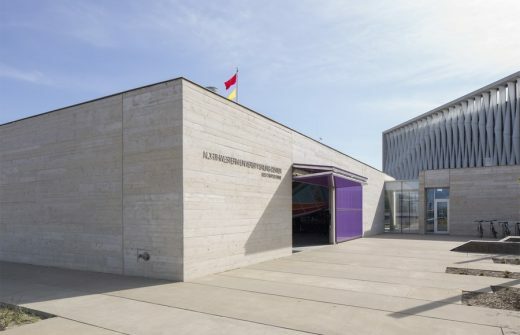 The Sailing Center, completed by Woodhouse Tinucci Architects, is Northwestern University’s (NU) most direct connection between the campus and its advantageous location on the shoreline of Lake Michigan. 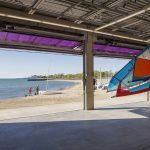 Right on the beach at the water’s edge, the Sailing Center is home to the University’s intercollegiate sailing team and its student sailing classes. 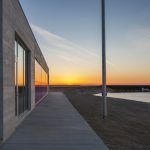 The LEED Gold Certified building is composed of staggered blocks housing the sailing office, a “garage” for boats and gear in front, the learning center and locker rooms in the back—all of which are linked by a light-filled, glass-lined entry. 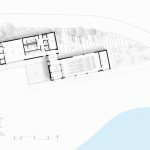 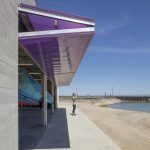 The discerning architects, Andy Tinucci and David Woodhouse, extended the structure horizontally, keeping it low in an effort to allow future buildings to enjoy shoreline views. 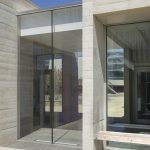 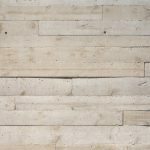 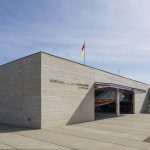 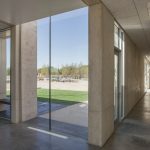 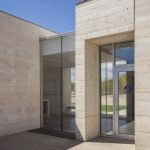 The center’s rugged concrete walls are embossed by the rough boards that made them, leaving horizontal ridges that create gentle shadow play and hint at clapboards weathering in the sun. 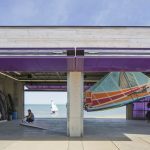 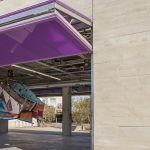 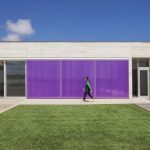 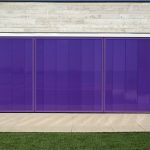 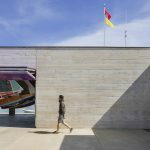 The sailing program’s competitive athletic core is blazoned by translucent plastic panels in a deep purple—NU’s official color— that fold upward or slide sideways to open directly to the beach launch area featuring an Astroturf carpet for drying sails. 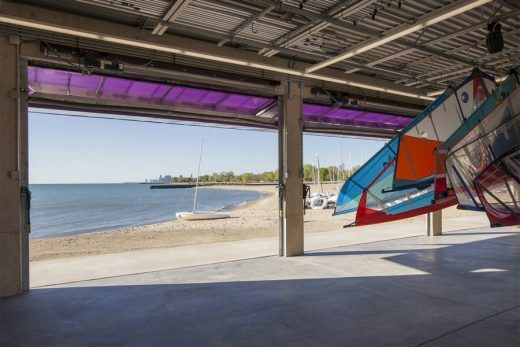 During the sailing season, the opening showcases expansive views of the Chicago skyline and during the winter, the folding doors can be closed for the safe storage of boats and gear.